Healing Haiti Team 2: Bayside/Tonka Day 2: "Hey you! Fight to Receive!" Bayside/Tonka Day 2: "Hey you! Fight to Receive!" The temperature is finally cooling down a bit as we calm down and relax after a full day of ministry. 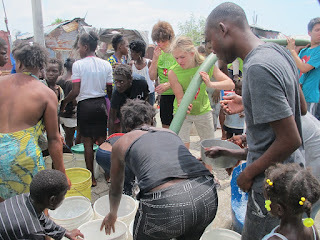 During the day we did have ample opportunity to cool down because we were delivering clean water to City Soleil. I'm so excited to share about our activities today but I'm getting a bit ahead of myself. Allow me to rewind to my personal devotional this morning. As I read 2 Timothy 1, I was reminded to seek out God's hand in everything and not stop searching until I have found it just as Onesiphorus did not stop seeking Paul until he found him. Fast forward, our ministry today was delivering clean water to City Soleil as I said before. What a joy and privilege it was for us to be the hands and feet that carry one of the most basic needs to all mankind. Yes, the ministry in itself was fulfilling. In some ways, I found this ministry to be heartbreaking. The truth of delivering water in City Soleil, the poorest city in Haiti, is that the people only receive water about once a week because there are 36 districts in the city that need water to be delivered. 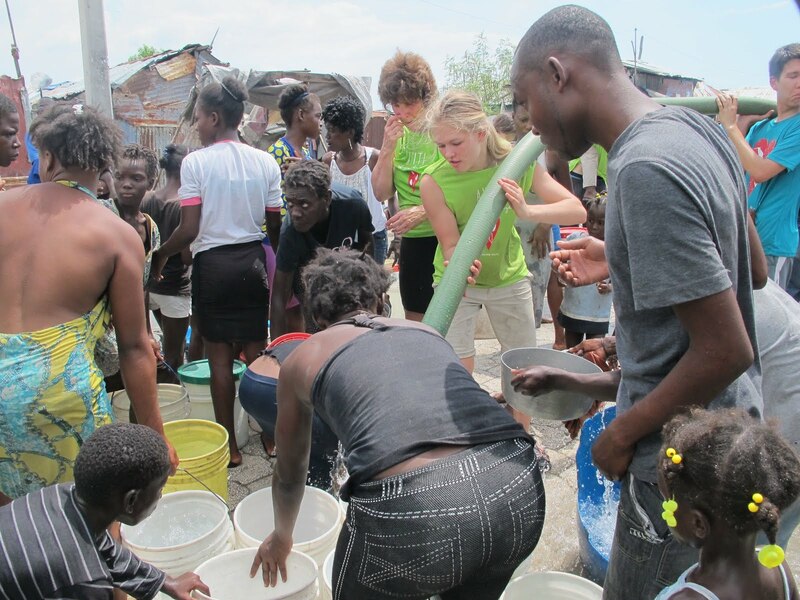 Thankfully, there are 2 water truck under the care of Healing Haiti's organization. Today, however, one of the trucks is out of commission. Please pray for speedy repairs to be made. Another thing that made my heart break was watching many of the people, mostly women, fight over the water. More than once, we had to shut off the hose to settle the people down and reform a single line. Looking back at how sad that made me, what's even more sad is that they were not all fighting for the "ultimate" basic need of all mankind: to know Jesus. How many times do we reject the good things that God wants to do in our lives because we don't think it's in our best interest when in reality, we should be fighting to receive all He has for us because we need everything He gives. Enough sadness, let's talk about some of the joys of the day. None of us have heard the words, "Hey you!" more frequently than we have in a single day driving in the Tap-Tap. At each stop, the children would run alongside the vehicle yelling "Hey you!" at us because they were so excited to see us. Before we even open the back door, the children would swarm around just waiting to be held and loved. It was not difficult to choose one to pick up because whoever got to you first would already be clinging to you. So much joy on each of their faces. Another huge joy was being able to see Hope Church. This church is literally built upon an old garbage dump and restroom area. Hope Church is a shining example of the word hope because it proves that beautiful things truly can come out of the dust, grime, and ugliness. Needless to say, the only place people go to do their business is now the indoor restroom. Actually, the facility is also used as a school for kindergarteners. Hope is found in the eyes of these sweet children because it is a free school for approximately 50 students. Amidst the sorrow, poverty, and joy, hope and love can easily be found when one asks God to reveal it to them. As a team, we have all been learning in our own ways that God does not call the equipped. He equips the called. God does not ever promise that things will be easy, but He does promise that we will never be alone going through it. Your prayers are much appreciated! 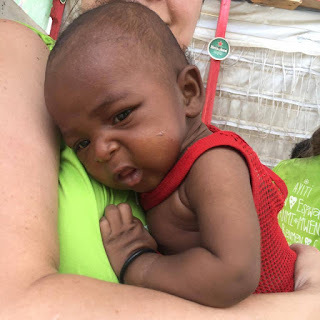 The water truck to be repaired quickly, and also Samantha has had some painful headaches due to the extreme heat, and Amida to continue hearing God's leading and guidance as she steps out of her comfort zone by being in Haiti. Thank you all for your support back home!